The estate agent who was recently fined R150 000 by the Equality Court firmly believes she has not done anything wrong. Here in her own words Penny Sparrow tells YOU what she thinks of the ruling and reaction to her Facebook post calling black South Africans monkeys. The estate agent who was recently fined R150 000 by the Equality Court after she was found guilty of racist hate speech firmly believes she has not done anything wrong. 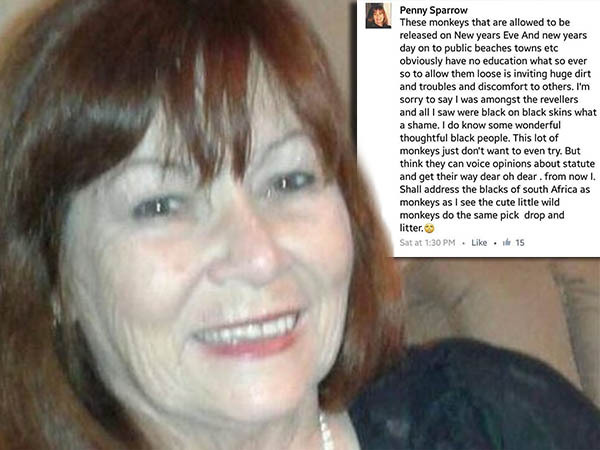 Here in her own words Penny Sparrow tells YOU what she thinks of the ruling and reaction to her Facebook post calling black South Africans monkeys. "I’m feeling remorseful about it all because I wasn’t aware that there’s going to be a case. The detective, who’s the criminal investigator has been in court with me most of the way. So, when he phoned me and said I'm due to court on Friday I phoned the investigator who said ‘You’re not registered’, don’t worry. It’s nothing on the court roll, it’s all propaganda. Then, the next thing was we’ve heard that there was court and that’s why Charmaine [her daughter] had to go but I’m not down on the South Coast at the moment. I’m with a friend up in Johannesburg. There was no time to get down, she tried to get it postponed and she couldn’t. I’ve never ever tried to escape the law. I was told it’s not a law thing but a civil case. It’s nothing to it. I find it disappointing that they’d release people like Julius Malema who have found as well that they don’t go to court and their cases are postponed. Mine wasn’t. I’m truly sorry to the equality court because they’re the people who need the apology. I can’t get a lawyer, I’m diabetic and I have been ill from all this stress. I think it’s so unfair and very disappointing. I’ve been given a very heavy sentence for something. I’m not a racist at all. I worked for an Indian lady, who was my best friend. I’m not a racist. I was just making the point about filthy beaches and nothing to do with everything else. I didn’t mean it. The white way is to say to our children, ‘You little monkey’. We don’t have hate speech for our children. We love our children. Even my animals, if they’re naughty and pull things out of the dustbin I also say, ‘You naughty little monkeys’. With the white people, we use monkey all the time because it means you get up to mischief. You do naughty things but monkeys are cute. I’m not a racist person at all; it was taken out of context. I didn’t mean to insult anybody, anybody at all. It’s the term I used with my children, grandchildren and many white people call their kids monkeys. It’s not hate speech to us. I’m very ill with this sugar, it goes right up and they can’t get it right because there’s so much stress because I’ve been accused of something I’m not. I’m truly sorry. I apologised profusely that I wasn’t insulting anybody. I wouldn’t do that. It’s an English way for people who are naughty. It’s how I used it. It has really shocked me and really drawn my sugar up and down and not so long ago I was in the hospital for over a week to try to get it right. With pneumonia. All sort of things and it’s all stress built up. I didn’t mean to hurt anybody. I’ve been living in the South Coast for about 23 years and I had to go because of bomb threats, murder threats, and family is down there. How could I encourage all that? I can’t have them put into trouble. I had to flee and stay with friends and right now I’m homeless. I can’t give an address because I stay two, three weeks with this person and that person and I’ve got animals and I have to leave them for a month. I had to leave them with a black lady the other time because she was the only person I could trust with my animals. I can only go to friends where I can take my animals with me. I’m a big animal lover. I’ve got a couple of cats and couple of dogs. I’ve stayed at about nine places since January. I don’t stay anywhere too long. It’s been incredible, shocking. I’ve got no job. I’m divorced. It’s been a battle. My children have had to pay for me to get call time and all these sorts of stuff and eat. I’ve got two sons, one overseas and one in Cape Town. They’ve been assisting – they have to I’m their mother. They know I’m a kind, gentle person. I’m not a troublemaker. I’ve been working for the newspaper years and years I know what I should say and shouldn’t. I didn’t mean any harm at all. It’s been terrible. I cry all the time. I’m so sad. I’ve been torn away from my children. I’ll never be happy under these conditions. I just can’t be with my grandchildren. I’m a great grandmother and I can’t enjoy the baby. I’ve endured so much pain… I hear people swearing all the time and I say, Oh my God, why was I caught for something I didn’t mean? I didn’t mean it that way, they’ve taken it the wrong way. In a wrong context. I was worried about the beaches, they were terrible and the litter up here is little. I left in October at Jawitz Properties because of my health. I was answering a friend who was complaining about the beaches. The bosses, lawyers, calling and threatening me and I said I left and don’t work for that company. They keep on calling me an estate agent, I’m not. I was just answering phones and helping people who came looking for houses. That’s all. But because I was very ill, I nearly died from pneumonia and diabetes. That’s why I left the real estate agency. The pain, I’ll never get over it. It’s for life. It’s a terrible, terrible thing to happen and to think it was caused by something I didn’t mean. I’m not a nasty person, I’m a well loved, happy person but not anymore. It tore me from getting a job, tore me away from my children, it’s wicked. They’re all I have. I will never be able to go back. I’d never be able to be given the peace I had. Never ever. It will never happen. I was very well known in Scottburgh. I helped Charmaine, her staff loved me [Penny worked at her daughter's business], and when they told people I wasn’t racist they wanted to kill them. They can’t even speak. I’m condemned. I could never return. Without my family it’s terrible. Of course, I miss them. They’re all I have. I have a great-grandson and he’s growing without me. From Scottsburg I went to PE and then Johannesburg. I asked [friends] if I could stay because I have no money for hotels. They said, come stay for a month and if there’s nonsense you have to go. I stayed quietly. People didn’t recognise me. No, honestly, if people are really nasty and horrible and then they deserve but I don’t deserve any of this. I could have said something worse but I didn’t. I said monkey because they’re naughty. I miss my family but you make friends and they’re left behind. Nobody wants to harbour me and my life at my age you don’t make new friends when you’re a great-grandmother, you don’t. I don’t go out playing cards or dancing, any of that. These are the things you collect through your life and I’ve been down in Scottsburg for years, happily married and things got wrong there and we got divorced and I stayed with my Charmaine and my grandchildren and I was very happy. I had a lovely job at the newspaper, I even went overseas to look after the elderly for a while. I then came back there was no position at [her former employer] at that time and then got the job at the real estate agent. The real estate agent owner got threats and her children got threatened. It was wicked. If I deserved it, sure enough, I’ll take the punishment but I didn’t. I’m a loving, kind, person. I did apologise but listening to Charmaine now, it’s the equality court that wants the apology and nobody has told me that. I didn’t even know what the equality court was. Yes, I loved Facebook because we could all exchange pictures and jokes and funny things. I loved it and to have to get out of it and leave it was terrible. I didn’t even realise that someone could pick up that story [her Facebook post] and send it to Twitter and got more tweets than Oscar Pistorius. I’m not good. I’m in a bad way. It’s very dangerous because I could go into coma because of the stress. I’m so apologetic about it because I know I didn’t mean it. I didn’t mean for people to get nasty with me. I was talking about the beaches and I wasn’t the only one. The beaches were bad this year, we’re used to it, I was born in East Africa, my first language was Swahili, a black language. I’m so used to black people. They’re good people. There’s nothing wrong with them. That’s why it has been hurtful because I haven’t meant in a bad, nasty way, not at all."